We are humans of change. What we wear today, the food we eat, even the direction we drive from one place to another changes. We change so many things so often that change has become the norm, and has little lasting impact. When was the last time you took a self-improvement course, maybe your New Year’s resolutions (by now, most of us have long forgotten those). And as a direct result, you were going to change, and maybe for a short time you did. Did the change not last? Most fall back into that old habit/way of life. And what of shift? 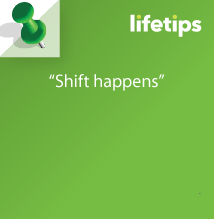 From where I coach, it is all about shift. When shift happens, we cannot go back. For shift to truly occur, a few things have to also happen. The first is an awareness of “fault line” within your BE-ing – a place of weakness. Next, things happen and your world gets shaken up along that fault line, and movement occurs. And in this movement, you cannot go back. The weak structures collapse, and are replaced by new stronger structures. Imagine wanting to quit smoking, then the doctor says they may have found lung cancer. In that instance a shift occurs. The smoker quits smoking instantly–wanting to live creates the shift space where smoking is stopped, NOW! Or perhaps you notice you keep doing the same thing, getting the same result. You are tired of that result. You talk to and hire a coach, and suddenly you are experiencing a whole new world because shift has occurred and you don’t go back. You have actually shifted, and you cannot undo that shift. 1) What am I most happy about in life? 2) What is not working for me in life? 3) How much effort have I put into changing it? 4) How much have I done to shift it? 5) How long did it last? Allow the inquiry to direct you. Our birthright is to be living an incredible life. Life is an adventure. And when you create a shift in your life, you just may be surprised at the joy that gets created in life. Create an AMAZING week. If you have questions, please contact me, I’d be happy to assist you!